Forggensee is an artificial lake and one of Bavaria's most beautiful mountain lakes. It reaches its full capacity between 1st of June and 15th of Oktober and is 12Km long and 3Km wide. 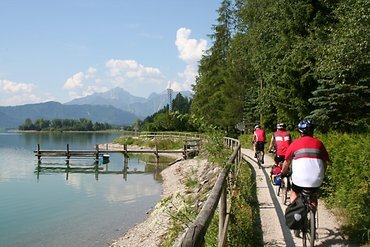 You can start with the 32Km long lake Forggensee circular route at our door step. This tour combined with visits to the two castles Schloss Neuschwanstein and Schloss Hohenschwangau or to the nearby lake Bannwaldsee will make for an amazing day tour.